The Egyptian Execration Statuettes (EES) project aims to create multispectral 2D+ and 3D images of a series of fragile Egyptian objects of the RMAH collection in order to 1) ensure their sustainability by reducing future handling, and 2) facilitate their study by developing an efficient course of action to record details on their surface. The selected case study includes 104 “Execration figurines”, roughly modelled clay figures representing prisoners, dating back to the Middle Kingdom (c. 1850 BCE) (Posener 1940). Their surface is covered with inscriptions in hieratic, an ancient Egyptian cursive writing system, enumerating enemies of the flourishing Egyptian empire. The focus lies on the direct neighbours of Egypt (Libya, Nubia and the Levant), but refers to Egyptian enemies as well. Therefore, these objects are invaluable primary sources for our knowledge of the ancient political geography of the region. They are internationally recognised as Prime Cultural Heritage Artefacts. Unfortunately, the study of this type of collection is hindered by their poor state of conservation (being made of unbaked rough clay), as handling and any intervention carried out on them can result in considerable material losses. The second major obstacle for researchers is the partial preservation of the ink traces and their poor visibility in white light. The project is involved in the development of a multispectral, multilight and easily transportable imaging system, the Multispectral Portable Light Dome (MS PLD), in collaboration with the KU Leuven’s Digital Lab and ESAT-VISICS. 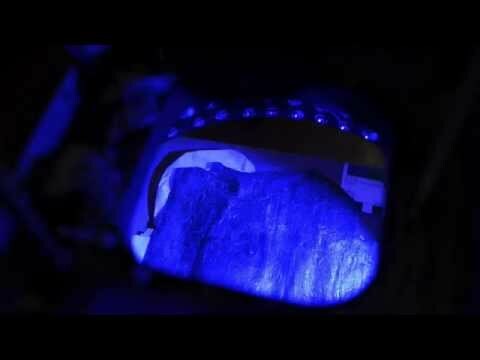 As our Portable Light Dome systems – the white light Microdome as well as the preceding Minidome (Willems et al. 2005) – have proven to be particularly suitable for the registration and visualisation of clay surfaces (e.g. Hameeuw & Willems 2011), the same approach was selected for this challenge. The main goal is to enhance the readability of the hieratic inscriptions on the execration figurines with UV and IR photography, while producing reliable 3D models and allowing scholars to examine the results in combination with the actual relief characteristics and properties of the physical object. . The newly developed interactive multispectral module offers the ability to search for the most optimal visualisation conditions while shifting between calculations based on the recordings with five different spectra (infrared, red, green, blue and ultraviolet), computed with photometric stereo algorithms. Preliminary tests on a selection of figurines with the MS PLD delivered very promising results. The readability of the red inscriptions, representing the vast majority of the texts, was significantly improved, enabling the reconstruction of parts of an inscription previously considered to be lost for good. The geometrical characteristics of the figurines can be interactively visualized by the viewer system of the PLD, enabling the study of the manufacturing process and other technical art studies. While the main goal of the project is to develop new MS imaging techniques, it also includes a comprehensive analysis of the state of preservation of the objects, essential for the development of these techniques. Furthermore, the chemical composition of the clay and the pigments was determined by Handheld X-Ray Fluorescence, confirming the presence of red ochre pigments and carbon black. Reaching its final stage of development, the entire collection of the Brussels execration figurines will be documented. Furthermore, the MS PLD system will also be tested on a wider range of materials bearing inscriptions or pigments, such as ostraca, tablets, papyri, bowls, etc. Additional non-destructive analyses on the materials are also considered. The MS PLD project thus enables a renewed and in-depth study of this valuable collection by Egyptologists, archaeologists and curators. This project is financed by the Belgian Science Policy Office (Belspo): Brain-be Pioneer BR/121/PI/EES, and supported by the IAP VII/14: Greater Mesopotamia. The development of the MS dome is realised in collaboration with the RICH project (Illuminare, KU Leuven), the Digital Lab of the Faculty of Arts (KU Leuven) and the department of electrical engineering ESAT-VISICS (KU Leuven). Poster - V. Boschloos, H. Hameeuw & A. 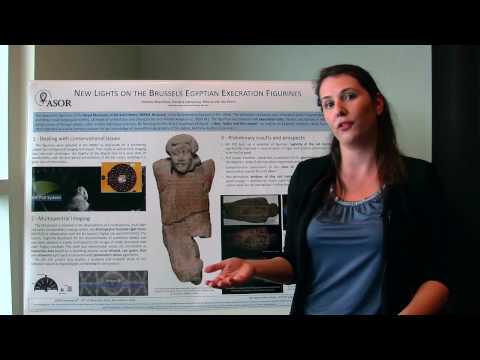 Van der Perre, New Lights on the Brussels Egyptian Execration Figurines, poster at the ASOR meeting, (San Antonio, 16-19 November 2016). Paper - A. Van der Perre, H. Hameeuw, V. Boschloos, L. Delvaux, M. Proesmans, B. Vandermeulen, L. Van Gool & L. Watteeuw, 2016, Towards a combined use of IR, UV and 3D-imaging for the study of small inscribed and illuminated artefacts, in: Homem P. M. (ed. ), Lights On … Cultural Heritage and Museums!, Porto, 163-192. Paper - A. Van der Perre, H. Hameeuw & V. Boschloos, 2016, ‘The Multispectral Portable Light Dome: Documenting the Egyptian Execration Figurines of the Royal Museums of Art and History, Brussels’, Journal of Ancient Egyptian Interconnections 11, p. 21-22. Paper - A. Van der Perre, D. Braekmans, V. Boschloos, F. Ossieur, H. Hameeuw & L. Delvaux, The Egyptian Execration Figurines of the Royal Museums of Art and History, Brussels: Conservation, Pigments and Digitisation, in Bulletin des Musées royaux d’Art et d’Histoire, Bruxelles 85 (2014) (in press), p. 5-38. Paper - D. Braekmans, V. Boschloos, H. Hameeuw & A. Van der Perre, Tracing unfired Ancient Egyptian Execration Figurines through Non-Destructive X-Ray Spectrometry Analysis" (forthcoming). H. Hameeuw & G. Willems, 2011, New Visualization Techniques for Cuneiform Texts and Sealings, Akkadica 132/2, p. 163-178.